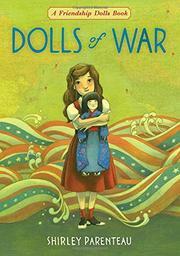 A young white girl tries to hold onto a special Japanese doll in the racially charged aftermath of the Pearl Harbor bombings in this third book about the Friendship Dolls. Macy, 11, treasures Miss Tokyo, a near–life-size doll that resides in the small Oregon museum her father runs. One of several handcrafted dolls originally exchanged between Japan and America in 1926, Miss Tokyo, who wears an exquisite kimono and comes complete with a full set of culturally appropriate accessories, had reminded Macy’s recently deceased mother of her own missionary childhood in Japan. As such, the doll provides one of Macy’s only links to her mother’s memory. With her 17-year-old brother freshly enlisted and her father distanced by grief, Macy writes her mother letters in the persona of Miss Tokyo. But now the country is at war with Japan, and anti-Japanese sentiment runs high. White townsfolk are pleased when their Japanese-American neighbors are rounded up by the government, and they want to burn Miss Tokyo. Macy struggles against a mob mentality—not always in realistic ways. Her emotional involvement with the doll is credible, but the greater emotional story—her father’s physical abandonment of her in order to avoid telling her a hard truth—is glossed over in a way that feels dishonest.